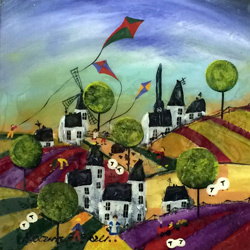 Rozanne Bell artist originals are the epitome of fun. She is a flamboyant gregarious character with a unique creative imagination that knows no bounds. Rozanne Bell has a sunny disposition, full of originality and wit. She is an exciting and entertaining person; full of energy and vibrancy and her art mirrors all these qualities. 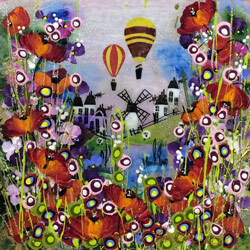 Rozanne Bell has five children and her artwork is embroidered into the heart of her family life. Image Size 15" x 15"
Image Size 40" x 15"
Rozanne Bell was born in Zimbabwe and she lived there for 40 years. She exhibited all over southern Africa and, through tourism, an American market for her work evolved. From Guernsey to Ghana her paintings hang in many banks and boardrooms all over the world.In 2002, the situation in Zimbabwe necessitated Rozanne's move to England. Rozanne's ability to adapt to a new environment coupled with her optimistic determination to succeed had brought a breath of fresh air to the British art market. The latest works by Rozanne Bell exhibit her unique view of an architectural landscape encompassing a curious and whimsical character combined with a realism and grittiness unequalled in the art world today. Rozanne Bell's sense of fun and artistic integrity combine to create highly desirable microcosms inhabited by the peoples of one's imagination. 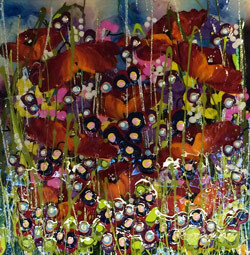 The subjects of Rozanne Bell's paintings are novel new and full of vitality. 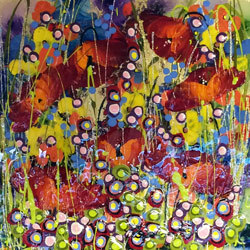 The influence of her African upbringing combined with the injection of British humour has ensured that Rozanne's paintings are much in demand. With no restriction of formal art training, Rozanne is able to cultivate her natural flair and zany approach. 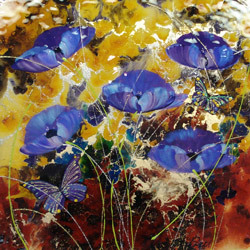 Her disciplined inspiration has provided exhibitions in Surrey, Dorset and Suffolk.